Incidence of measles in the US from 2005 to 2014. Imported cases are those acquired outside the United States and brought into the US. 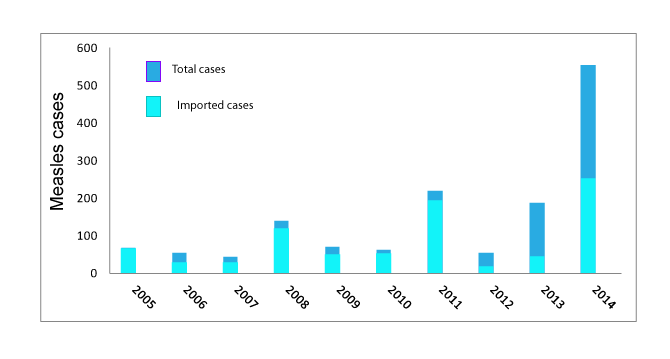 Cases not imported include those acquired in the US but linked to imported virus cases or ones for which the virus source is unknown. This most recent outbreak of measles that started in California’s Disneyland has to date infected 84 people and spread to over fourteen states. Sixty-seven of these measles cases appear directly linked to visits to the Disneyland amusement park. Measles is one of the most contagious diseases known. In fact, someone without pre-existing immunity to measles has a 90% chance of becoming infected if exposed to the virus or an infected person. Once considered eliminated in the US, in recent years measles has made a strong comeback and stems largely from susceptible individuals who were not vaccinated. 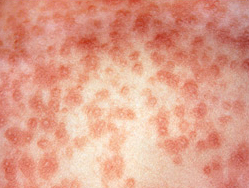 Transmitted by aerosol droplets, measles infection is asymptomatic or prodromal for 7 to 10 days prior to the appearance of clinical symptoms. Like many common infections, measles’s first manifests as low fever (38.3 oC, 101 oF), a general malaise and a loss of appetite. This early period is soon followed by cough, runny nose and conjunctivitis which last an additional 2 to 3 days. During this time small bright red spots with bluish-white centers also appear, called Koplik spots. 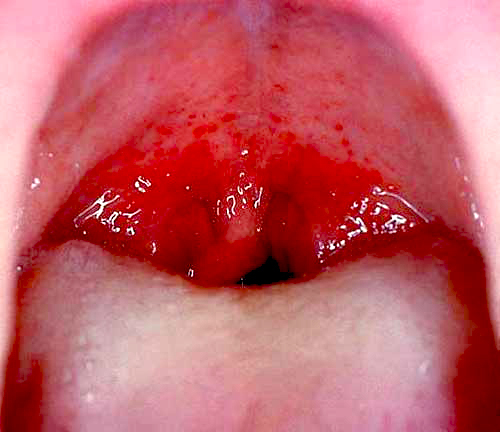 Appearance of Koplik spots in the oral cavity is considered an early diagnostic sign of measles infection. Soon after these early symptoms the classic measles rash appears. 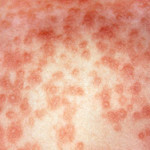 Measles rash first appears on the face and behind the ears and soon spreads to the trunk and extremities. In most measles infections, the rash lasts 3 to 4 days from the time of its first appearance. Fading of the rash signals an end to measles infection. Because measles virus replication and host immune response occurs largely in lymphatic tissues, swollen lymph nodes or mild enlargement of the spleen may result. Common complications during measles infection include diarrhea and hepatitis (found more often in adults) which may require hospitalization if severe. In regions where childhood malnutrition is high, measles may cause blindness as a result of virus replication in the eye and corneal scarring. Measles infection induces a prolonged period of immunosuppression that may last several months. Risk of secondary infections from bacteria or other viruses leading to pneumonia or bronchitis are high. 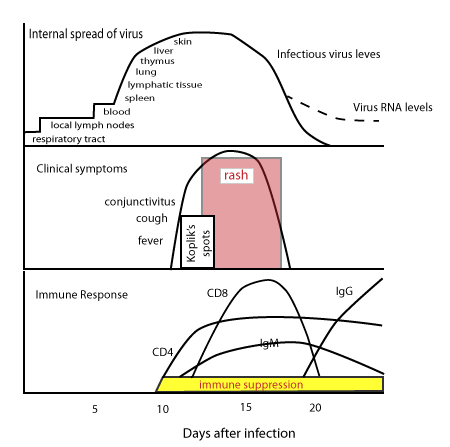 The reason for prolonged immunosuppression after measles infection is unclear but laboratory findings suggest impaired immune cell antigen presentation and T lymphocyte function. There is currently no standard antiviral treatment available for measles virus infection. Antivirals that stop other RNA viruses including HIV and Hepatitis C have shown little benefit in animal models or in clinical settings. To prevent blindness high doses of vitamin A during acute measles infection is recommended. Although the mechanism is unknown, vitamin A appears to have the added benefit of decreasing clinical symptoms and the risk of child death. 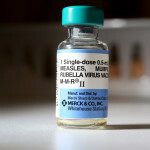 There is an effective vaccine for measles. Attenuated measles, mumps and rubella virus are given together in the MMR child vaccine. These live, attenuated viruses mimic natural infection and generate a robust immune protection but with lesser overall symptoms. MMR vaccine is commonly given at 6 to 15 months of age. Times of vaccination vary and depend on the local risk of acquiring natural measles infection (as in high measles-endemic areas) or the need to wait and allow maternal antibodies, found in an infant’s blood, to decrease. High amounts of maternal antibody will react to the virus proteins in the MMR vaccine and reduce the child’s normal immune response. MMR vaccine is best given at 2 separate times. This ensures the child will have a strong response and complete protection. MMR Vaccination with a single dose is shown to be 77 to 84% effective where as MMR vaccine given at two separate times yields a protection level of 94%. MMR vaccination dramatically alters the course of measles spread through a population. Increasing the number of protected individuals in the population blocks measles access to those with no prior immunity to the virus (commonly called increasing herd immunity). Because measles virus is so infectious, it is estimated that 90 to 95% of the population needs to be immunized to prevent or interrupt a measles virus outbreak. History has shown populations where greater than 90% are vaccinated have a reduced number of outbreaks and lengthened times between outbreak occurrence. 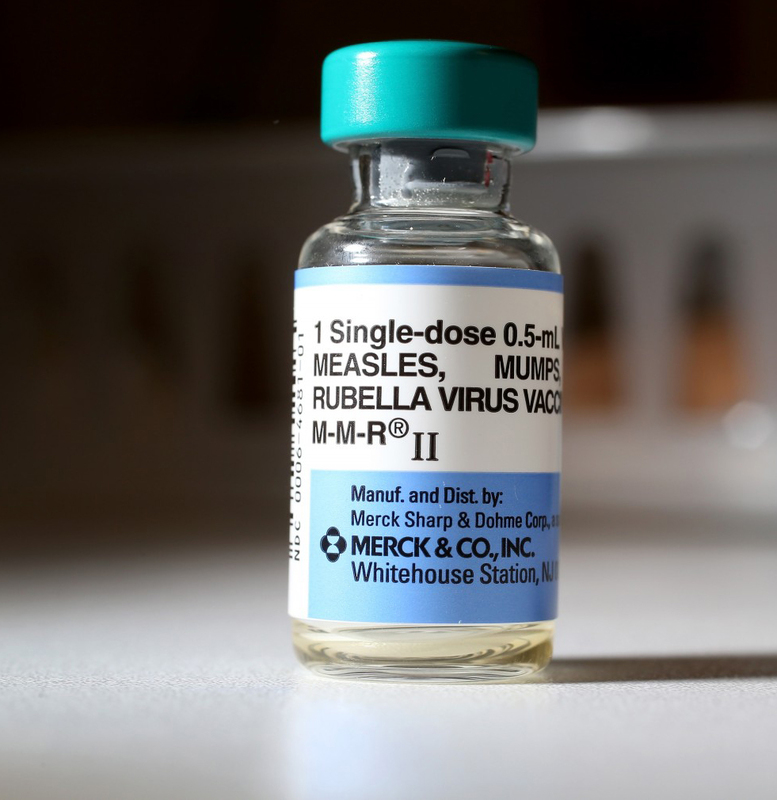 The recent refusals by parents to vaccinate their children for philosophical or religious beliefs or for reasons of economic affordability has resulted in increased numbers and incidences of measles virus outbreaks. Griffin, D.E. 2013. 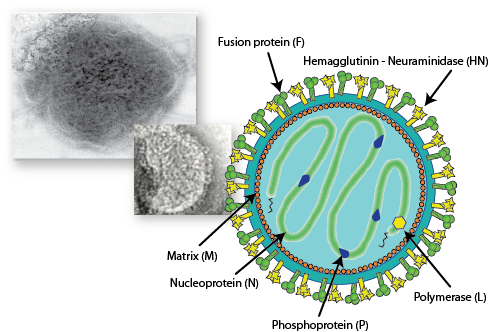 Measles virus. In Fields Virology, 6th ed., Ch. 36. Knipe, D.M. and Howley, P.M. editors, Wolters Kluwer, Lippincott Williams & Wilkins, Philadelphia PA. This entry was posted in measles virus, Viruses in the News and tagged disneyland measles outbreak, measles, measles outbreak, measles virus, vaccination on January 30, 2015 by Jerome Tanner, PhD DBA.